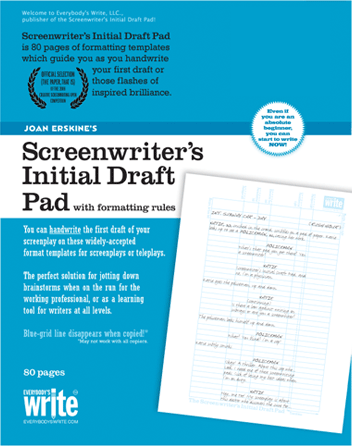 The Screenwriter’s Initial Draft Pad consists of 80 pages of specially graphed paper templates that guide you when handwriting a screenplay. The templates show you how to place characters’ names, dialogue, and action precisely where they belong on the page of a screenplay, according to the industry approved format. The covers of the book contain complete illustrated, formatting rules – a quick reference for the professional or an essential guide for anyone who wants to try their hand at screenwriting. Capture those moments of inspired brilliance, anywhere, anytime! Have you ever had a great idea for a movie but didn’t know how to get started? Joan Erskine shows you how to watch popular films as a way to learn screenwriting. From the beginning, you'll be working on your own screenplay! 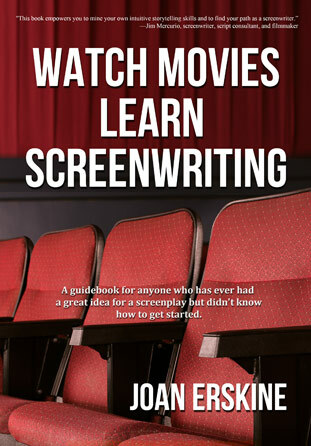 Watch Movies, Learn Screenwriting contains everything you need to get started on what you’ve always wanted to do, but never thought you could, including 32 pages of Screenwriter’s Initial Draft Paper “borrowed” from the Screenwriter’s Initial Draft Pad.